Bio Notes: Alexander Nisbet Paterson was born at Berkeley Terrace, Glasgow on 3 May 1862, the youngest son of Andrew Paterson and his wife Margaret Hunter. The Hunters were sewed muslin manufacturers. When his father was orphaned at nineteen his uncle James Hunter appointed him a foreman in his warehouse and took him into partnership two years later at the early age of twenty-one. He was a good watercolourist as well as an astute businessman and most of his family developed artistic interests. James, born 1854, became the Glasgow Boys painter and William, born 1859, was later to own a Bond Street art gallery in London. Alexander was educated at the Western Academy and at Glasgow Academy. His parents wanted him to enter the church and he attended Glasgow University where he graduated MA in 1882. He really wanted to become a painter like his eldest brother but his parents could not afford two painters in the family. As they were friendly with the Burnets, architecture was decided on as a compromise. Probably after some initial training in the Burnet office, he followed John James Burnet's advice and entered the Ecole des Beaux-Arts and the atelier Jean Louis Pascal in 1883. By that date his eldest brother James had returned from Paris, where he had studied in the studio of Jacquessen de la Chevreuse and the atelier of Jean-Paul Laurens. At the Ecole he also spent time in the atelier of M Galland who specialised in decoration. His record at the Ecole was very competent but not especially distinguished, probably because he had entered it with rather less practical experience than most. During the vacations he made study tours of France, Holland and Belgium. In 1886 Paterson returned to the Burnet office to find John Archibald Campbell had been taken into partnership. There he worked first as an improver and as a draughtsman, his skill as a watercolourist being much in demand for the presentation perspectives of the firm's projects. In 1889 he won the RIBA silver medal and passed the qualifying exam. He was admitted ARIBA on 3 March 1890, his proposers being Richard Phené Spiers, John Burnet senior and his new employer in London, Colonel Robert William Edis. After about a year with Edis as head draughtsman, he moved to the rather more up-to-date practice of Sir Aston Webb & E Ingress Bell as Webb's assistant on the competition for the South Kensington Museum before commencing independent practice in Glasgow late in 1891. Although they were never to be associated again in business, Paterson remained close to the Burnets and also developed a friendship with William James Anderson taking adjoining offices and sharing an apprentice, Alexander David Hislop. In 1896 having won the Godwin scholarship Paterson took a career break to visit the USA and produced 'A Study of the domestic architecture in the United States of America in the year 1896, with special reference to questions of plans, construction, heating, drainage etc.'. Burnet also visited the USA in that year but the extent to which their paths crossed is not known: but he did take the opportunity to visit his fellow 'élève' in Pascal's atelier, Stewart Henbest Capper, the newly appointed Professor of Architecture at McGill University in Montreal. Paterson's practice was probably cared for by Anderson during his absence. On his return he married Margaret (Maggie) Hamilton, sister of the Glasgow School painter James Whitelaw Hamilton in 1897, his father giving him Turret, one of the four houses in Helensburgh he had financed to help start Paterson's practice; his father and mother themselves moved to Torwood House, Rhu in 1893 as all the family were keen on sailing. Two years later, in 1899, Paterson achieved some fame by coming a close second to James Miller in the competition for the Glasgow International Exhibition of 1901. In 1900 Paterson took on as his assistant Donald McKay Stoddart. Born in 1875 Stoddart was the son of J Hastie Stoddart, editor of the Glasgow Herald and had recently returned from an extensive tour of France and Italy following an apprenticeship with Honeyman & Keppie in 1893-97 and classes at Glasgow School of Art under William James Anderson. Somewhat unusually he was given freedom to have a small private practice. 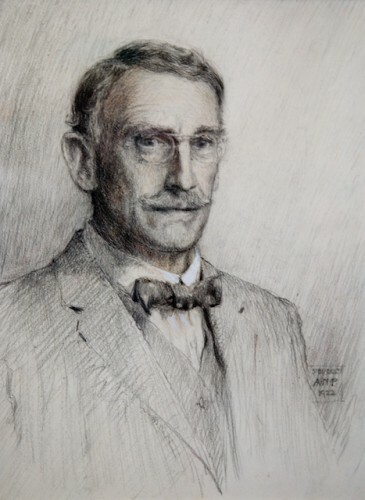 He was admitted LRIBA on 4 July 1910 his proposers being Paterson, John Keppie and Andrew Graham Henderson. In 1901 Campbell Douglas found it necessary to dissolve his partnership with Alexander Morrison and in early 1903 Douglas merged his practice with Paterson's as Campbell Douglas & Paterson, the retained office being Douglas's at 266 St Vincent Street. Their relationship was a very happy one but in 1906 Douglas had a bad recurrence of an old illness (probably that which afflicted him in 1888) and was forced to retire. The merger was carried out in a very civilised way, Douglas going to some trouble to place those staff made redundant with other practices. Paterson thereafter practised alone but retained Douglas's name in the firm title until at least 1910. He was admitted FRIBA on 28 February of the latter year, his proposers being Burnet, Phené Spiers and Aston Webb, and was elected ARSA in 1911. From that date onwards, if not earlier, he became a close friend of Robert Lorimer. He became a Governor of Glasgow School of Art in 1916 and from at least that time onwards became deeply committed to architectural education as A Graham Henderson's obituary records. In 1919 on his return from war service Stoddart was taken into partnership. But his health had been damaged and his role in the office remained much the same as it had been before 1914, as in Paterson's words, he suffered from 'a want of boldness in general conception, the proverbial failure to see the wood for the trees'. Stoddart was admitted FRIBA on 30 November 1925, his proposers being Paterson, Keppie and John Watson, the last reflecting the close relationship which had developed between Paterson and the Watsons. 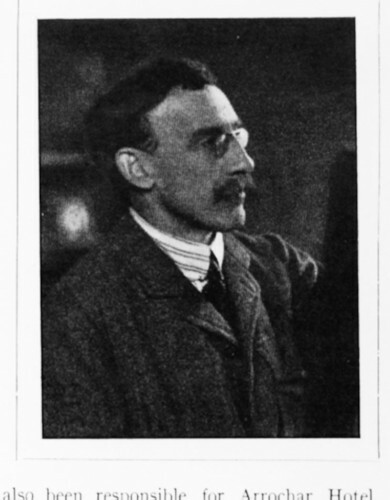 Stoddart died of pneumonia early in 1930. Paterson's own health was affected by cancer of the throat. The operation to remove it was successful but he had to relearn how to speak and c.1936 handed his practice over to John Watson Junior of Watson & Salmond. Paterson then devoted the rest of his life to watercolour painting, having been RSW since 1916. He exhibited at the Royal Academy, the Paris Salon and the New English Art Club, as well as at the principal exhibitions in Scotland. His other interests were golf, hill-walking and the Ancient Monuments Board of which he became a member in 1930. Paterson died at Helensburgh on 10 July 1947. He was survived by Maggie who died on 21 January 1952, his artist daughter Mary Viola and a son Alastair Hamilton Paterson who entered the army and rose to the rank of Major General. 1902 Clyde Street School Helensburgh Dunbartonshire Scotland Begun on his own but completed in partnership? July 1912 Netherton Newton Meanrs Renfrewshire Scotland May be by Paterson but drawings need to be checked. 1922 Holy Trinity Episcopal Church Kilmarnock Ayrshire Scotland Internal alterations - inlcuding nave roof and mullions and transoms of windows? 1922 Scalesheugh Cumberland England Further work?